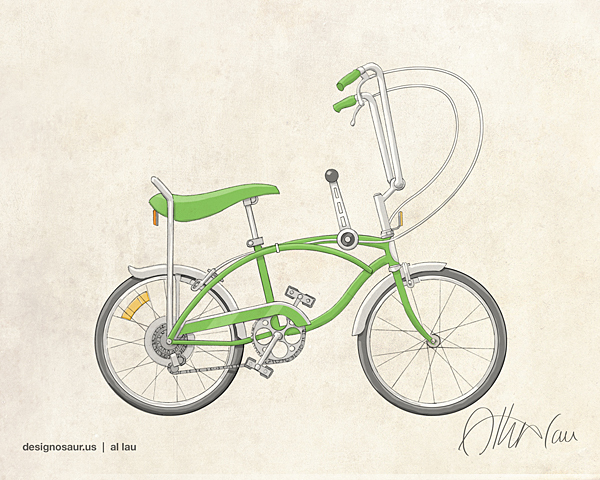 In cities, a single speed is the preferred type of bicycle by commuters due to its lightness and simplicity. It is so bare bones that it doesn’t even have brakes or cables. There are no derailleurs. Basically, that means you’re feet are the drive train, the gears AND the break. So get ready to pedal hard when you have to climb that steep hill because you can’t downshift to a low gear ratio. And then, how do you go down the other side of the hill? Very carefully, I would say. I had the awesome opportunity to do a set of pen & ink type drawings for the redesigned website of a local bike shop, called the Brooklyn Bicycle Company. My little sketches appear on the homepage, navigational buttons and other landing pages. Their website has a nice clean look with professional photos of their unique products. If you are looking for a classic style bicycle or a simple urban design, I recommend checking out Brooklyn Bicycle Company. Just order the bike model that fits your needs and accessorize it. They will send it to a bicycle shop near you and assemble for no additional fee. Hey. Spring is less than a month away. Are you ready for cycling on you’re favorite trails? The Volkswagen Beetle has come a long way from being a concept of Hitler’s in the 1930’s. Originally called the Volkswagen Type 1, it was born from the need of a cheap and simplistic car design, yet powerful enough to travel on the Autobahn. From out of the darkness of WWII, however, the Bug is adopted as a symbol of Peace. And now, a fun way to get to your favorite activity destination. Am I starting to sound like a car commercial? 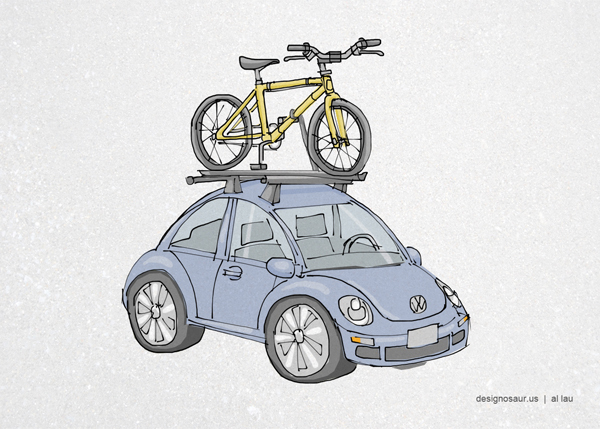 My drawing is based on the new Beetle that was re-introduced to the world in 1998 (including a cool mountain bike). It’s a lazy Sunday. Though, still a great time to take the bike out and hit a trail. 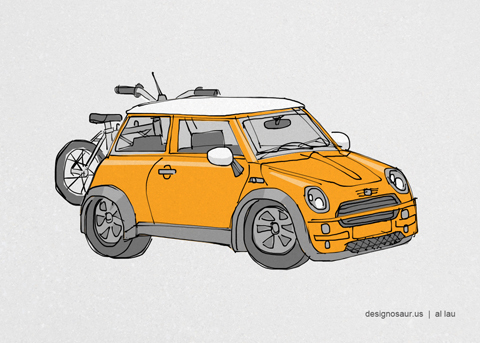 Here’s my drawing of the lovable Mini Cooper. Happy 4th of July weekend y’all! 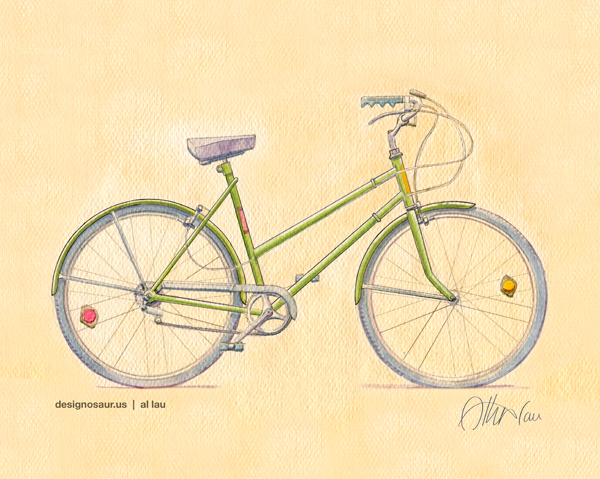 This is a new version of my watercolour painting of an antique 1970’s Schwinn bicycle. As a perfectionist, I keep tinkering with the details of the illustration. This time, I’m happy with the final reworking… for now.